Welcome! We're here to help you plan your trips and holidays in Venezuela. Along the coast in the Caribbean Sea, we have a variety of beautiful beaches and places to practice windsurfing, kite surfing, snorkeling or enjoy diving (diving) or sports fishing. We invite you to discover the islands of Margarita, Coche and Cubagua, the archipelago of Los Roques or the mysterious Tortuga. Beaches along the jungle as Choroní, with coral reefs as Morrocoy (near Tucacas and Chichiriviche), Mochima (near Puerto La Cruz), and Playa Medina at Paria.In Venezuela we have one of the most beautiful and ancient places in Earth: La Gran Sabana with the tip flattened mountain called Tepuyes and Canaima, where we can see the highest waterfall in the world: Angel Falls ... we invite you to know not only from your computer: this is an adventure that can make the way you wish. Come to Venezuela and discover it, with our advice: since 1990 we have specialized in bringing and organizing trips for tourists from all over the world and also organizing events throughout the country ... If do you want to read some testimonials, click here. You can also choose your own accommodation in Venezuela: What kind of hotel you're looking for? Something luxury? Or do you prefer an inn? This is the place to search for hotels, inns, camps and apartments to stay. Look for a hotel in several ways: by destination, by state or city (place). Would you rather search for an inn or a hotel by entering the name or part of the name? It works too. You can also select the options that best suit your needs .. There are different ways to search a Hotel: By Touristic Region, by State, or by place name you were told. Do you preffer to search for a Hotel or an Inn by writing its name, or part of its name? It can also be done that way. Even more yet. 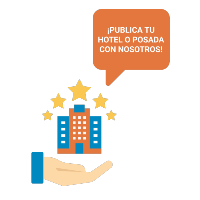 You can select the options you wish between the services and features offered by the Inns or Hotels... and therefore find the hotels or Inns that adapt more accourate to your wishes.